Life @ My Cozy Corner is so good today. a great time playing outside. White Eden climber and Gertrude Jekyll shrub roses. The Grosso Lavender stems are starting to grow. I love the little bowl and the bird in this angel's hands. an angel to represent each one of our granddaughters. This is the first angel I bought years ago. and she is so sweet. The praying angel is surrounded by a pink fairy rose. Next week my angel will be covered in pink blooms. I have bought most of my angels at Tuesday Morning. Looking for the next angel. Hopefully I will find the right one soon. what is going on at My Cozy Corner. O MY!! So many beautiful angels!! So pretty in the garden!! Your angels and your garden are absolutely gorgeous!! Omg!! Absolutely gorgeous!!! You have the most beautiful angels I have ever seen!!! Spectacular gardens!! Just beautiful to reflect your granddaughters! So beautiful, Betty! I love them! I love, love, love your angels! BEAUTIFUL, Betty! Hi Betty, I am Peggy. My only sister was named Betty. We lost her to cancer when she was 32 and I 34. We both had 5 children at that time since we had married in a double wedding in 1060. I collect indoor angels in memory of her. I always recognize the name Betty. Love the tea cups too. I have run out of places to put my collections. Blessings Betty to you and yours. 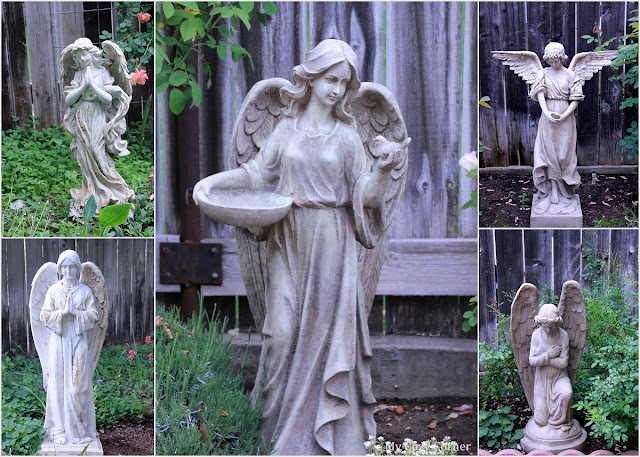 The angel is a perfect accent to your lovely garden. So beautiful! Thanks for sharing at Home Sweet Home!